Along with Tomcat Courtney, Bill Magee and Len Rainey, singer and guitarist Robin Henkel has been one of San Diego's pre-eminent blues practioners. 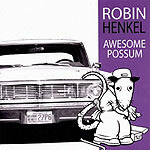 His new album, "Awesome Possum," is a fun romp through old-time blues standards and new songs by Henkel and his co-hort Ben Hernandez. The album opens with a straight-ahead cover of "Sweet Home Chicago"  well, as straight-ahead as Henkel can get. With his distinctive, swooping singing style, it sounds like no one else at all. He sing-talks Blind Boy Fuller's "Walking My Troubles Away," with the real focus on that second track his acoustic guitar as he picks and strums the lead simultaneously. After that, the album alternates between original songs and covers. Songs by Kokomo Arnold and Jimmy Reed meet their equal in new songs by Henkel co-written with frequent collaborator Hernandez (who sits in on harmonica and vocals for the four songs they co-wrote). Henkel also wrote the last song, an instrumental on baritone guitar titled "Bari Bag." All of the originals have a trad feeling about them, and fit in perfectly with the covers of the blues classics. Then there's the cover of "Buffalo Gals" on guitar, Billy Watson's harmonica, with Kellie Rucker on shaker and Hernandez on washtub bass  it's a bit like a time machine taking you back to the 1920s and finding yourself in a Mississippi juke joint. Steeped in the rural musical traditions of the blues, Henkel's guitar playing is loose yet dignified, rambunctious and world weary. Joined by Rucker, Watson and Hernandez on complementary acoustic instruments, the sound is traditional without ever sounding like a museum piece. It is blues of the highest sort.